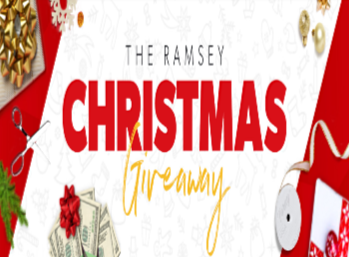 Dave Ramsey Christmas Giveaway – Win $5,000! ENTER SWEEPSTAKES HERE – Dave Ramsey Sweepstakes page. ENTRY LIMIT – Limit one online entry per person per day plus up to three (3) bonus entries over the entire sweepstakes. ELIGIBILITY – You must be a legal resident of one of the 50 United States or the District of Columbia, and must be of the legal age of majority in his/her jurisdiction of residence. SWEEPSTAKES ENTRY PERIOD – Sweepstakes begins Nov. 1, 2018 and ends Dec. 15, 2018. PRIZES – One Grand Prize winner will receive $5,000. Five First Prize winners will each receive $500. WINNER’S LIST – For a list of winners, send a self-addressed, stamped envelope to The Lampo Group, 1749 Mallory Lane, Brentwood, Tennessee 37027, Attn. Ramsey Christmas Giveaway Winners – Marketing Department. Unless otherwise required by law, requests received after one month following the drawing date will not be filled.